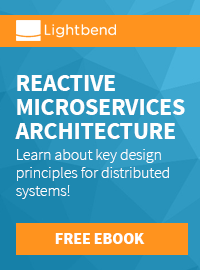 Have you ever been struggling with the percentage of test coverage in your projects? It's essential for all development projects to not only have a good feeling about your overall test coverage but to have some tool at hand to resilient number at hand for each iteration you do. If you are working with Java EE projects, you have to find a way to check coverage for your container managed beans. 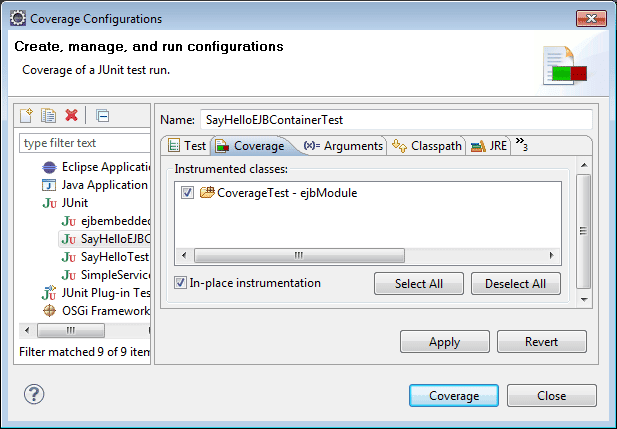 This is a short howto about using Eclemma with Eclipse and GlassFish Embedded Container to get coverage information about your EJBs. Get yourself a recent Eclipse Helios build (I am using the Eclipse IDE for Java EE Developers) and install any additional components (e.g. m2eclipse, GlassFish server adapters) you may need. Don't forget to get a recent GlassFish Server 3.1 Open Source Edition install (Full Platform). I'm going to demonstrate the usage of the Embedded Container in two different ways, so you should have Maven at hand, too. Last step is to install Eclemma into your Eclipse version. What's all this stuff around? If you start googling about embedded EJB glassfish and so on, you get a couple of solutions out there. Some mention the EJB 3.1 container API, some the embedded GlassFish, some talk about the Embedded Maven Plugin. So the very first thing I'd like to do is to tell you about the options you have to run your enterprise beans in embedded mode. The complete GlassFish server has a embeddable API. These is falling into different catagories. Top level APIs (org.glassfish.embeddable) which provide classes and interfaces necessary to embed GlassFish and perform lifecycle operations, application deployments and runtime configurations. Scattered Archive APIs (org.glassfish.embeddable.archive) which contain an abstraction for a scattered Java EE archive. The Web Container APIs (org.glassfish.embebdable.web, org.glassfish.embeddable.web.config) which provide classes and interfaces necessary to programmatically configure embedded WebContainer and create contexts, virtual servers, and web listeners. The advanced pluggability or Service Provider Interfaces (org.glassfish.embeddable.spi) to plugin a custom GlassFish runtime. The last part is the EJB container APIs (javax.ejb.embeddable) which are part of the EJB 3.1 Specification, Embeddable Container Bootstrapping. All those APIs help you to completely integrate a GlassFish server into your own infrastructure. If you are willing to use the complete embedded Server you have to add either the full- or the web-profile jars to your project. Starting with Java EE 6 and EJB 3.1 you have the new API for running your beans outside the container (GlassFish 3.1 docs). The EJB 3.1 Embeddable API supports all EJB 3.1 Lite features with addition of the EJB timer service and testing of EJB modules packaged in a WAR file. For EJB modules in a WAR file (or an exploded directory), if a web application has one EJB module, and there are no other EJB modules in the classpath, those entries (libraries) are ignored. If there are other EJB modules, a temporary EAR file is created. For EJB modules in a WAR file to be tested, the client code must use EJB modules with interfaces or without annotations. Those EJB modules are not part of the classpath and can't be loaded by the client class loader. This API is mostly valuable for outside container testing of your EJBs. If you are willing to use this container API only, you simply have to add the %AS-INSTALL%/glassfish/lib/embedded/glassfish-embedded-static-shell.jar from your existing (!) GlassFish installation to your project. The Maven Glassfish Plugin is a Maven2 plugin allowing management of Glassfish domains and component deployments from within the Maven build lifecycle. It encapsulates domain configuration and deployment attributes within the build configuration for a more rapid development integration loop and simplified management of continuous integration testing of components destined for deployment within the Glassfish V2 and later JavaEE containers. As far as I know, this plugin simply facilitates the available asadmin commands to control a GlassFish server installation. Now implement your Testclass. Let's call it SimpleServiceTest. The real magic happens in @BeforeClass and @AfterClass. The only thing left to do is to actually implement your test. Great! You are done. Happy coding. Now let's look at the next option. Create a new EJB Project with eclipse and add the %AS-INSTALL%/glassfish/lib/embedded/glassfish-embedded-static-shell.jar to your build path. Don't forget to remove the Server Runtime you assigned during project creation. Again: Create your EJB(s), and a Testcase. And again, the real magic happens in @BeforeClass and @AfterClass. To prevent this, you have to change the Coverage configuration for your test to "In-place instrumentation". EclEmma tries not to touch your project's content. Therefore class files are normally instrumented outside your project in a temporary folder. This is exactly where the fancy JNDI names come from. In-place instrumentation will modify your class files. 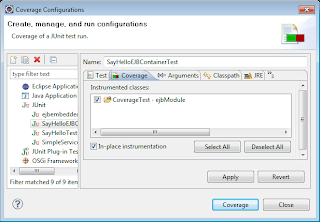 Instrumented class files can not be used with launch modes other than Coverage. Therefore a clean build is required after a coverage launch with in-place instrumentation. Beside this change, everything works exactly the same way as with the maven example. It works. Even if it is a very strange and violent thing to do. You could instrument your classes with additional coverage information and you could also test them with your embedded GlassFish. Hope this little introduction was helpful.